What Else Can I Expect From an Online Master's in Nursing Program? Are you ready to take your nursing career to the next level with a master's degree? Online MSN programs provide an opportunity for nurses to get the education they need to advance their career while continuing to earn an income. Read on to learn more about what you can do with an online MSN degree, and find the program that best aligns with your career goals. With new healthcare legislation, increased emphasis on preventative medicine, and aging baby-boomers, demand for healthcare services for MSN graduates is expected to grow 31% between 2012 and 2022. IS THERE AN MSN ONLINE WITHOUT A PRACTICUM? Some MSN programs that are not clinical-based may not require a practicum. Most degrees that are clinically based require a practicum as a way for students to gain hands-on experience and show that they understand key nursing concepts. Read more here..
CAN YOU GET A NURSING DEGREE ONLINE? Many schools that offer an MSN program offer it in a completely online format. Students should check with their prospective program to ensure there are no on-campus requirements. Read more here..
HOW TO EARN A NURSING DEGREE ONLINE? First, students must meet admission requirements, which commonly include holding a BSN and having work experience. Students must also maintain a minimum GPA throughout the program, and many programs require students to complete a capstone project. Read more here..
ARE ONLINE NURSING DEGREES LEGITIMATE? It's important to check whether a prospective program or school is accredited. Accreditation ensures that minimum standards of education are met. Nurses should look for programs that are accredited by the Commission on Collegiate Nursing Education. Read more here..
CAN YOU GET A JOB WITH AN ONLINE NURSING DEGREE? Most MSN students already hold a BSN and have experience as an RN. Earning an MSN prepares you to earn a higher salary and obtain leadership positions in the field. Read more here..
Are you ready to take your nursing career to the next level with a master's degree? An online master of science in nursing (MSN) degree will help distinguish you from your bachelor's-holding colleagues and allow you to advance in your career more quickly. An online master's in nursing will also prepare you for higher-level nursing roles that normally require a graduate degree, such as nurse anesthetists, nurse midwives, and nurse practitioners. Master's in nursing online programs are geared toward nurses who plan to take on managerial or administrative roles at hospitals, clinics, and other healthcare facilities. The curriculum combines classroom-based studies with practicum training at the hands of certified nurses. Most MSN programs require a two-year commitment, and allow you to earn a degree specialization in areas like clinical leadership or healthcare administration. You may also choose to complete an accelerated RN to BSN program; these programs are aimed at students with a non-nursing bachelor's degree, and generally take three years to complete. If you want to increase your earning power and ramp-up your skill set while you continue to work, an online MSN program is the first step to moving forward in your career. 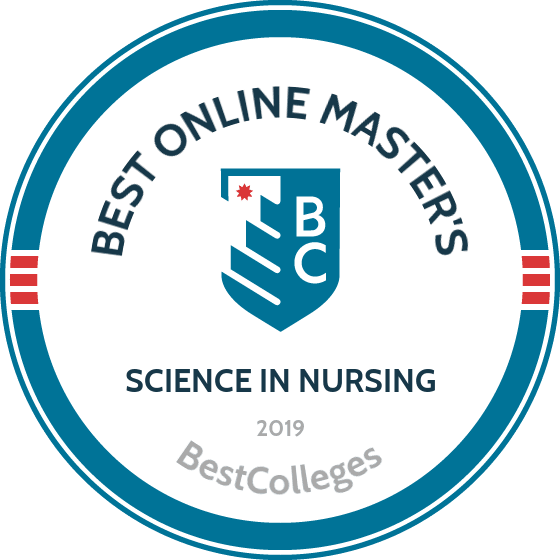 Read on to learn more about choosing an online MSN program and the career opportunities you can look forward to with an online master's in nursing. WILL AN ONLINE MSN PROGRAM PROVIDE ME WITH THE SKILLS I NEED TO ADVANCE MY NURSING CAREER? In most cases, students who are accepted into an MSN program have a bachelor's degree in nursing. The MSN builds on undergraduate studies by allowing you to develop expertise in particular areas of nursing. Generally, you can expect to take classes like statistics and data analysis, nursing research, nursing theory, medial information technology, health promotion, and clinical decision-making. Throughout the course of your MSN program, you will contribute to healthcare research, grow your professional network, and gain skills in management and leadership. You also get plenty of hands-on training from clinical practicum sessions. WILL AN ONLINE MSN WORK WITH MY SCHEDULE? MSN online programs are designed for convenience and flexibility; you can access course lectures and readings, submit written assignments, take exams, and communicate with your professors any time of day from the comfort of your home computer. Current technology also enables you to study on the go using a laptop, tablet, smartphone, and other devices with Wi-Fi. When it comes to completing the practicum component, many programs will help you get set up at a site that's close to your residence. MSN graduates will qualify for dozens of jobs after graduation. Depending on your specialization, you may pursue work as a nurse practitioner, nurse midwife, nurse anesthetist, or other specialized roles. You will also be well-positioned to pursue employment as a registered nurse, licensed practical nurse, medical and health service manager, and other titles that require a bachelor's degree. Please note that most nursing roles that deal with patient care require state-issued licensure; more information about licensing requirements and procedures can be found in the 'Careers' section below. WHAT ARE THE BEST ONLINE MSN PROGRAMS? Choosing a program is an incredibly personal decision, and only you can properly evaluate whether a target school's strengths match your educational needs. The following ranked list of schools should serve as a helpful starting point in your search for the best online MSN programs in the United States. If you are considering an online master's in education, be sure to contact admissions specialists at different colleges and universities to learn more their about specific MSN requirements and offerings. Founded in 1876, Johns Hopkins University remains one of the top private universities in the country. In addition to campuses in Baltimore, Maryland, and Washington, D.C., JHU offers online degrees. The Johns Hopkins School of Nursing provides an online MSN with a health systems management track for nurses who want to advance their careers. With a full-time and part-time track, the MSN online appeals to working nurses. The health systems management concentration trains nurses in leadership skills. Within the track, graduate students can take electives in administration, health management, information technology, and case management. The program also emphasizes fiscal management and strategic planning, core skills for healthcare managers. Graduates pursue management-level positions in healthcare organizations. Online nursing students complete 35 credits and 376 clinical hours to earn the master's degree. The program incorporates core courses in evidence-based practice, biostatistics, and advanced practice nursing. Graduate students on the health systems management track then complete 23 credits in their specialization. Applicants need a bachelor of science in nursing from an accredited institution, with a minimum 3.0 GPA. Prospective students submit transcripts, three letters of recommendation with at least one professional recommendation, a goal statement, and a current resume or CV. Applicants must also provide evidence of a current nursing license. All incoming students must complete an undergraduate statistics class before enrolling. Established in 1789, Georgetown University now offers online programs, including several online master's degrees in nursing. Online nursing students train to become adult-gerontology acute care nurse practitioners, family nurse practitioners, women's health nurse practitioners, and nurse midwives. The degree prepares graduates for board certification in their concentration. Georgetown's online MSN programs prepare graduates for independent practice as primary care providers. Students in the family nurse practitioner track complete 44 credits plus 650 clinical hours. The dual nurse midwife/women's health practitioner program requires 49 credits and over 1,000 clinical hours. All students complete 2-3 on-campus intensives, depending on the concentration. Georgetown admits applicants with an accredited bachelor's degree in nursing and a current RN license. Nurses also need a "C" or better on a three-credit undergraduate statistics course. Applicants provide a resume or CV, official transcripts, a personal statement, and three letters of recommendation. The letters should come from a clinical supervisor, a professor, and a practicing advanced practice nurse. Online applicants participate in a live recorded interview to explain their personal and professional preparation for an advanced practice role. A private institution located in Durham, North Carolina, Duke University offers multiple online MSN degrees for nurses seeking to become nurse practitioners, nurse educators, or leaders within healthcare organizations. Most programs take two years for full-time students or three years for part-time students to complete. Graduate students complete 42-49 credits, depending on their concentration. Compared to other top online nursing master's programs, Duke offers a variety of specializations, including adult-gerontology nurse practitioner, family nurse practitioner, and neonatal nurse practitioner. Master's students can also specialize in health informatics, nursing education, or nursing and healthcare leadership. Students take four core classes in evidence-based practice, population health, advance nursing practice, and nursing research. Students then complete advanced courses in their concentration. Nursing students can also pursue a specialty certificate. For example, the family nurse practitioner program offers specializations in cardiology, endocrinology, oncology, orthopedics, and HIV. Applicants submit a resume or CV, transcripts, three letters of recommendation, and three essays. While Duke does not set a minimum GPA for admission, the nursing program requires official GRE scores for applicants with less than a 3.4 undergraduate GPA. Duke waives the GRE requirement for applicants with a graduate degree. Duke recommends at least one year of nursing experience before applying, and certain programs require 1-2 years of clinical experience. Incoming students begin the program during the fall and spring semesters. The oldest private research university in California, the University of Southern California dates back to 1880. The school offers an online master of science in nursing with a family nurse practitioner specialization. Students in the family nurse practitioner program train as advanced practice nurses who provide primary care for infants, children, and adults. Graduate students typically earn their degree in 21-33 months. The family nurse practitioner program incorporates 49 credits of coursework, covering physical assessment, disease prevention, diagnosis, and illness management. The classes include advanced health assessment across the lifespan, clinical management of adult patients, and transforming research evidence into practice. Nursing students also complete 784 clinical hours at a local healthcare facility, including family practices, pediatric offices, urgent care sites, and community health clinics. In addition to online courses, USC educates students through two on-campus intensives in Los Angeles. During these intensives, students complete skill assessment exercises with faculty. Prospective students need a bachelor of science in nursing from an accredited institution with a minimum 3.0 GPA. The school also requires a three-credit statistics course and a current RN license. The family nurse practitioner program requires one year of clinical experience. Applicants provide a resume, transcripts, a personal statement, and three letters of recommendation. Admitted students who do not meet prerequisite grade minimums, earned their degree more than five years ago, or earned their nursing degree abroad must complete a two-credit preparatory class before enrolling. Located in Nashville, Vanderbilt University dates back to 1873 when railroad magnate Cornelius Vanderbilt gave a $1 million endowment to found the institution. Today, Vanderbilt ranks as one of the top private universities in the United States. Vanderbilt offers several online programs, including an online MSN in nursing and healthcare leadership. The part-time program, designed for working healthcare professionals, prepares nurses for managerial positions in nurse-managed clinics, community-based clinics, hospitals, and other settings. Students earn the master's degree in nursing online after two years of part-time study. The nursing and healthcare leadership program requires 37 credits, with coursework in leadership, nursing informatics, healthcare finance, and strategic planning. Students learn through online conferencing, video-streamed lectures, local practicum experiences, and on-campus interactive visits. These on-campus experiences require 2-3 days in Nashville four times during the degree. Prospective students need an associate or bachelor's degree in nursing with a minimum 3.0 GPA. Admitted students without a BSN must complete a part-time online program with bachelor's-level courses before taking graduate classes. This option requires two additional years. During the application process, RNs provide official transcripts, three letters of reference, and four essay responses. The program offers a fall start date and typically enrolls 5-15 students per year. From its Orlando campus, the University of Central Florida boasts the largest student enrollment of any U.S. university. Its reach extends beyond campus to online programs, including an online master of science in nursing. Students enrolled in the MSN online program choose among three concentrations: nursing leadership and management, nurse educator, and nursing and healthcare simulation. Potential positions for graduates include chief nursing officer, nurse administrator, nursing manager, and director of nursing. The nursing leadership and management concentration prepares nurses for leadership roles in healthcare organizations, while the nurse educator concentration trains nurses to teach undergraduate nursing courses at colleges and universities. The unique nursing and healthcare simulation focus emphasizes mastery of simulation programs, leading to careers as leaders in clinical simulations. Students complete 31-36 credits, depending on their concentration. The school accepts nurses with a bachelor's degree and applicants with a bachelor's in a non-nursing field who complete prerequisite courses. Applicants provide official transcripts showing a bachelor's degree from an accredited institution, an essay on career goals, and a CV. All applicants need a current RN license in the state if they plan to complete their clinicals. A public research institution located on Long Island, Stony Brook University enrolls over 26,000 students on campus, with additional students participating in its online programs. The school offers two online master of science in nursing programs, with concentrations in nursing education and nursing leadership. These master's in nursing online programs help nurses gain clinical training and leadership experience, preparing graduates for careers as nurse educators or managers. Most students complete the degree in 2-3 years, depending on the track. The nursing education program trains MSN students to educate nurses in clinical settings and nursing schools. The program incorporates 45 credits, with classes in quality improvement, safety, and healthcare technologies; clinical pharmacology; and advanced health assessment. Nursing education students also take specialized courses in advanced teaching strategies. Nursing leadership students complete core, research, and nursing leadership courses, with 36 credits required for the master's degree. Both programs rely on a cohort model with scheduled on-campus immersions. Prospective students need a bachelor's degree in nursing and one year of recent professional experience. The school admits applicants with an RN license and a bachelor's degree in a non-nursing major if they submit a clinical practice portfolio for review; the portfolio review requires an additional fee. All applicants provide transcripts showing a minimum 3.0 GPA; a current RN license; and three letters of recommendation. New York residents enjoy a tuition discount. A private institution in Omaha, Nebraska, Clarkson College focuses on health science degrees, with nursing options at the undergraduate and graduate levels. Clarkson offers an online master's degree in nursing with three concentrations: nursing education, nursing healthcare administration, and nurse practitioner. MSN students who want to become nurse practitioners choose between the adult-gerontology primary care nurse practitioner and family nurse practitioner tracks. Clarkson's online MSN programs prepare nurses through patient-centered training. Students pursuing nursing education or nursing healthcare administration complete 39-42 credits and 135 clinical hours. The nurse practitioner programs require 47 credits and 650 clinical hours. Students complete 17 core credits and four research project credits before taking classes in their specialization. Clarkson requires two years of clinical experience before enrolling in major courses; nursing students can meet the requirement during their core classes. Students complete an evidence-based practice journal article during their final semester, presenting research conducted in a clinical setting. Prospective students need a bachelor's in nursing from an accredited nursing program with a minimum 3.0 GPA. Applicants also need a current RN license for the state within which they plan to conduct their clinical experience. Applicants submit official transcripts, a scholarly essay, a resume, and two professional references. Nurse practitioner applicants must submit an acute care skills assessment form. Clarkson enrolls new students in the fall, spring, and summer semesters. Located in Orange County, California State University-Fullerton enrolls more students than any other school in the Cal State System. In addition to on-campus classes, the school provides online degree options, including an online MSN in nursing leadership. With a blend of clinical and coursework experiences, the program trains nurses for leadership roles in healthcare. Graduates pursue positions in healthcare administration, such as nurse manager. Students complete 40 credits, with classes in nursing research, advanced decision-making, healthcare quality and safety, and informatics in nursing. Students access the online course material at any time, providing flexibility for working nurses. The school currently only enrolls online students in Orange, Riverside, and Los Angeles counties. During their final two semesters online students complete coursework at a distance while meeting the clinical practicum hours at local sites. All nursing students take a culminating experience course in their final year, either completing a research project or a master's thesis. Prospective students need a current California RN license and a bachelor's degree in nursing or a related field from a regionally accredited institution. Applicants with a bachelor's in a non-nursing field must complete a class on community health nursing before enrolling. Cal State-Fullerton recommends one year of work experience and requires a minimum 3.0 GPA either cumulatively or for the last 60 semester hours. Applicants submit official transcripts, a statement of purpose, a current resume, and three letters of recommendation. Established in 1870, Ohio State University now offers several online programs, including an online master of science in nursing with four concentrations: nurse practitioner, neonatal nurse practitioner, psychiatric mental health nurse practitioner, and clinical nurse leader. Students complete 42-47 credits, depending on the track. The degree prepares nurses for advanced roles in healthcare, including as independent caregivers and collaborative researchers. Students complete core classes, including innovation leadership in advanced nursing practice, quality improvement and informatics, and health promotion and disease prevention across the lifespan. Students then complete classes within their specialty. Family nurse practitioners take classes in advanced health assessment, advanced pharmacology in nursing, and clinical practicums. Some online classes meet at set times, while others allow students to access course materials at any time. Students pursuing the online master's in nursing must spend two days on campus for a clinical skills evaluation. Applicants need an accredited bachelor's degree with a minimum 3.0 GPA and a current RN license. The program admits students with a bachelor's in a non-nursing field and an RN license. OSU also admits students currently applying for an RN license as long as they complete the process before classes begin. Applicants provide college transcripts, a current resume or CV, a purpose and goals statement, and three letters of recommendation. Applicants also complete an online interview. A private online university founded by 19 western governors in 1997, Western Governors University relies on the competency-based learning model to educate students. A pioneer in online education, WGU offers several online master's programs in nursing, with concentration options in nursing education, leadership and management, and nursing informatics. Under the competency-based model, students progress through coursework as soon as they demonstrate mastery of the material, allowing nurses with prior knowledge and experience to expedite graduation. In the nursing informatics master's program, 93% of students earn their degree in 15 months or less. The school charges a flat tuition rate per six-month term. The online MSN programs at WGU require 14-15 classes, depending on the track. All students complete core courses, including advanced nursing practice, comprehensive health assessment, and a field experience. Students then complete courses in their specialization, such as evolving roles of nurse educators, student-centered learning, or field experience for nurse educators. The school also offers bridge programs for RNs without a bachelor's degree. In the RN-to-MSN program for nurse educators, students complete 37 courses and earn the degree in 1-4 years. Prospective students need a current RN license and an associate degree, a diploma in nursing, or a BSN, depending on the program. Applicants submit a resume and proof of active nursing experience. Founded by an act of Congress in 1821, George Washington University confers degrees from Washington, D.C. The school also offers online degrees, including an online master of science in nursing. Students choose from six concentration areas: adult-gerontology acute care nurse practitioner, adult-gerontology primary care nurse practitioner, family nurse practitioner, nurse-midwifery, nursing leadership and management, and psychiatric mental health nurse practitioner. The school also offers RN-to-MSN programs for students in adult-gerontology primary care nurse practitioner, family nurse practitioner, and nurse-midwifery programs. Students complete 36-48 credits, depending on the track. The nursing leadership and management option requires the least credits, while the nurse practitioner concentrations require more. Students in the RN-to-MSN program complete additional credits. All students take core classes in nursing leadership, health policy, and population health, with research courses and a field-specific curriculum for each concentration. Family nurse practitioners take courses in advanced health assessment, lifespan primary care, and advanced pharmacology. All students complete practicums to build clinical experience. Applicants need a bachelor's degree in nursing from a regionally accredited institution, with a preferred minimum 3.0 GPA. Nurses must also hold an active and unencumbered RN license to enroll. Applicants submit official transcripts, two letters of recommendation, a personal statement, and a current resume. The online MSN programs require two on-campus residencies that test diagnostic skills, assess clinical training, and measure end-of-program skills through simulation-based learning. Founded in 1855 in East Lansing, Michigan State University enrolls over 50,000 students, making it one of the largest universities in the United States. In addition to on-campus programs, MSU offers online programs, including a graduate program in nursing. The online master of science in nursing for adult-gerontology clinical nurse specialists with a nurse education concentration prepares nurses for roles as educators and professors. The fully online nursing master's programs at MSU incorporate 47-51 credits of coursework, with classes in advanced practice nursing, pathophysiology, clinical decision-making, and healthcare policy. The nurse educator training includes coursework on curricular design, an immersion session, and a teaching internship. Students can access coursework at any time. Nursing students must attend a one-day orientation on campus at the start of their degree. Prospective students need a bachelor's degree in nursing with a minimum 3.0 GPA on the last 60 credits by the time they begin the MSN program. The school allows up to 12 graduate-level transfer credits toward the MSN and only admits students in the fall. Graduates qualify for doctoral programs, clinical positions, and faculty roles. The degree also meets the requirements for the adult-gerontology clinical nurse specialist certification exam. A public research university in southern California, San Diego State University dates back to 1897. The School of Nursing grants bachelor's and master's degrees, including online degree options. Registered nurses can earn an online master's in nursing leadership in healthcare systems from SDSU. The program prepares nurses for leadership roles in healthcare organizations, emphasizing experiential learning. Students choose between a full-time or part-time option to complete the 37-credit degree. Full-time students earn their degree in two years, while part-time students take three years. The curriculum incorporates classes on nursing administration practice, information systems for nursing, quality improvement and program evaluation, and financial management in health systems. Nurses also take a practicum to build hands-on experience. Prospective students need a bachelor's in nursing from an accredited nursing program with a minimum 3.0 GPA. Nurses with less than a 3.0 GPA can contact a graduate adviser to discuss their options. The school admits applicants with a California license to practice as an RN and recommends at least one year of work experience. Applicants also submit GRE scores, transcripts, a personal statement, and three letters of recommendation. The school accepts up to 12 transfer credits from an accredited graduate program in nursing. Students must complete courses in no more than seven years. A private, Jesuit institution in Spokane, Washington, Gonzaga University takes its name from Saint Aloysius de Gonzaga. In addition to its on-campus degrees through the School of Nursing and Human Physiology, Gonzaga offers several online MSN programs. Nurses can choose from three concentrations: nursing leadership in healthcare, family nurse practitioner, or psychiatric mental health nurse practitioner. Nurses on the leadership track complete 30 credits plus 180 clinical hours. The curriculum includes courses on evidence-based practice, clinical prevention for diverse populations, and healthcare management -- as well as a nursing leadership in healthcare practicum. The nurse practitioner programs require 47 credits plus 660 clinical hours that students complete in nine semesters with six on-campus immersions. Students in Washington, Idaho, Oregon, and Montana must schedule a site visit from a Gonzaga faculty member during their practicum courses. The MSN options prepare graduates for advanced practice roles in nursing. Prospective students must hold a bachelor's degree from a regionally accredited college or university plus a current RN license from an accredited nursing program. Gonzaga admits nurses with an RN license and a bachelor's degree in a non-nursing field, though these applicants may need to take foundational nursing courses prior to graduate coursework. Gonzaga recommends a minimum 3.0 GPA; applicants with a lower GPA can still apply with a GPA explanation and either GRE or MAT scores. Applicants must submit official transcripts, two letters of recommendation, a statement of purpose, and a resume or CV. Gonzaga may request a phone or Skype interview. A public research university, Texas A&M began as the Agricultural and Mechanical College of Texas in 1876. It offers multiple online programs, including a family nurse practitioner MSN program. The degree prepares graduates for advanced practice nursing roles, such as family nurse practitioners who act as primary care providers for infants, children, and adults. Full-time students complete the 48-credit program in five semesters. The curriculum includes classes on advanced health assessment, diagnostics and procedures, and primary care of families. During the advanced health assessment course, students attend two on-campus clinical experiences and complete 45 clinical hours of training. The primary care course also requires a short residency. Online students arrange to complete additional clinical hours under a preceptor in their local area. The school accepts nurse practitioners, physicians, and physician assistants as preceptors. Prospective students need a bachelor of science in nursing and an RN license to practice in Texas. The school requires a minimum 3.0 GPA plus an undergraduate statistics course. Applicants provide official transcripts, a professional resume, three letters of recommendation, and a personal statement. Applicants do not need to submit GRE scores or provide proof of work experience, though the program recommends 1-2 years of work experience after completing the BSN. The selections committee may conduct interviews as part of the admission process. Currently, the school only admits Texas residents, and the program enrolls new students for fall semester start dates only. Located outside of Hartford in Storrs, the University of Connecticut dates back to 1881. It enrolls over 30,000 students and offers several online programs, including a graduate degree in nursing. The neonatal nursing master's degree offers a part-time or full-time option. Neonatal nurse practitioners provide primary care to newborns, including babies in neonatal intensive care units. The 44-credit program takes five semesters of full-time study or eight semesters of part-time study to complete. Designed for experienced neonatal nurses, the nurse practitioner program trains RNs to become advanced practice nurses. Students complete courses in advanced neonatal embryology, advanced health assessment, and advanced neonatal nursing theory. Students also complete practicums to gain hands-on experience. UConn requires two years of full-time RN-level experience in a level-three neonatal intensive care unit before beginning the clinical practicum courses. Incoming students attend an on-campus orientation and complete their coursework fully online, with two additional on-campus visits for simulation experiences. Prospective students must hold a bachelor's degree or higher from a regionally accredited institution with a recommended minimum 3.0 GPA, plus two years of work experience. Applicants submit three letters of reference, a current resume, and official college transcripts. Applicants also provide written responses explaining their goals for an MSN and why they chose a neonatal nurse practitioner track. The school enrolls new MSN students in the fall, spring, and summer. A Catholic university located 35 miles from Chicago in Joliet, the University of St. Francis offers multiple online graduate degrees, including several online MSN programs. Concentrations include family nurse practitioner, psychiatric mental health nurse practitioner, nursing administrator, and nursing educator. The school also offers an RN-to-MSN pathway for each of its concentrations. Graduates take leadership roles in nursing, education, and healthcare delivery. Online MSN students complete 34-47 credits, depending on their concentration. Students earn their degree in 29-36 months, including clinical placements. All students take 16 credits of core classes, including advanced practice nursing, population health, and evidence-based healthcare. Within the concentration, students take advanced coursework like clinical management, healthcare decision-making, and advanced health assessment. Nurse practitioner and nursing administrator students can choose to add 16 credit hours of education courses. In addition to online coursework, the MSN programs incorporate up to four on-campus residencies. Prospective students need a minimum 3.0 undergraduate GPA and at least two years of full-time clinical nursing practice in the past four years. Applicants provide proof of a current RN license, two letters of recommendation, and a resume. Nursing faculty conduct interviews with applicants. The school only enrolls students from certain states. Applicants can choose between a full-time and part-time option. A public university located in Boca Raton, Florida Atlantic University enrolls over 30,000 students. In addition to on-campus programs, FAU offers several online MSN programs. Graduate students in nursing choose from concentrations such as nursing administrative and financial leadership, advanced holistic nursing, clinical nurse leader, and nurse educator. These concentrations prepare graduates for board certifications and leadership positions. The school offers all programs except the nurse educator track fully online; nurse educator students complete their degree through a hybrid format. Students complete 33-39 credits to earn the degree, depending on their concentration. The school offers full-time and part-time enrollment options, with most full-time students finishing in six semesters. In the advanced holistic nursing track, students take 33 credits, including courses on advanced nursing practice, advanced health assessment, foundations of holistic nursing, and advanced holistic nursing. Graduates qualify for board certification in advanced holistic nursing. Nurse educator students complete advanced courses in nursing education, evaluation methods, and learning methods. Prospective students need a bachelor's degree in nursing from a regionally accredited institution with an accredited nursing program. Applicants who do not meet the minimum 3.0 GPA requirement can apply by submitting GRE or MAT scores. Applicants submit official transcripts, a current resume, proof of a current RN license, one letter of recommendation, and a philosophy of nursing essay. Founded in Mississippi in 1892, William Carey University offers a private Christian education through campuses in Hattiesburg and Biloxi. The school offers several online programs, including a master's degree in nursing online. Nursing graduate students choose from four concentration areas: gerontological nursing, clinical nursing education, nursing administration, and case management. The 41-credit degree prepares nurses for advanced clinical and leadership roles, including national specialty certifications such as the certified nurse educator credential. All students complete 35 credits of core classes, with courses in informatics in nursing education, trends in advanced practice nursing, clinical supervision, and instructional strategies. The curriculum, which emphasizes nurse educator training, prepares graduates for faculty positions in nursing schools. After completing core courses, nursing students take electives, such as healthcare economics and finance, integrating holistic healthcare in nursing education, and gerontological nursing. Prospective students need a bachelor's degree from an accredited school of nursing. The school requires a minimum 3.0 GPA from an undergraduate degree or a minimum 2.5 GPA in the final 30 credits. Applicants must hold a current, unencumbered RN license to enter the program. Applicants submit official transcripts, a current resume, a statement of professional goals, and two letters of recommendation -- with at least one letter from a former nursing instructor. The school also offers a 53-credit joint master of science in nursing and master of business administration degree. A Jesuit university overlooking the Golden Gate Bridge and Golden Gate Park, the University of San Francisco dates back to 1855. It runs additional campuses in downtown San Francisco, the Presidio, San Jose, and Sacramento and offers online programs, including a master's in nursing online. Designed as an RN-to-MSN program, registered nurses complete the 46-credit degree in two years. Nurses with a BSN can also enroll and complete the MSN after 35 credits. The school offers classes year-round on a flexible schedule. The curriculum includes healthcare policy and ethics, epidemiology and population statistics, assessment across the lifespan, and healthcare systems leadership. Students complete two practicums and an internship to gain clinical experience. Graduates complete 400 practice hours through the practicum and immersion experiences. Applicants need a bachelor's in nursing or an associate degree in nursing, plus a current RN license. The school recommends a minimum 3.0 GPA for admission. Applicants provide unofficial or official transcripts, a resume, two letters of recommendation, and a personal statement. The program admits new students in the fall and spring. A public university in Greenville, North Carolina, East Carolina University dates back to 1907. With nearly 30,000 students, ECU ranks as one of the largest universities in the state. The school offers several online programs, including online MSN programs in nursing education, nursing leadership, adult/gerontology clinical nurse specialist, and psychiatric mental health nurse practitioner. MSN students must complete 40-53 credits. Most programs require two years of full-time study. Nurse midwife students take courses on health assessment, nurse midwifery management, reproductive physiology, and postpartum care. Nurse education students take courses on educational concepts, curriculum development in nursing, and evaluation in nursing education. All MSN students complete practicum hours to build clinical experience. Applicants need a bachelor's degree in nursing from an accredited nursing program. For full admission, applicants need a minimum 2.7 GPA for their degree and a minimum 3.0 GPA in the nursing major. Applicants also need a current, unrestricted RN license in North Carolina or a member state of the National Council of State Boards of Nursing. Applicants submit transcripts, a written statement on their career goals, three professional references, and GRE or MAT scores. Nursing faculty conduct interviews with prospective students. The psychiatric mental health nurse practitioner concentration only admits North Carolina residents, while the nurse midwifery concentration only admits North Carolina and South Carolina residents. Alabama's flagship public university, the University of Alabama enrolls nearly 40,000 students. In addition to on-campus programs, UA offers online programs, including a master's in nursing. Graduate nursing students choose from three concentrations: case manager, clinical nurse leader, and nurse administrator. The degree prepares graduates for roles in healthcare leadership, including as mentors and clinical health providers. Students complete 32-39 credits, depending on their track. The case manager track, for example, requires 39 credits, including a practicum. Students train to work with patients who need long-term healthcare plans, including patients diagnosed with cancer or elderly patients. The 39-credit clinical nurse leader track trains nurses to oversee care coordination of patients and act as a clinical decision-maker in healthcare organizations. The 32-credit nurse administrator concentration emphasizes policy and organizational operations issues. Prospective students need a bachelor's degree in nursing from a regionally accredited nursing school. The program also requires a current, unencumbered RN license in the state where the student plans to complete their clinical hours. Applicants need a cumulative 3.0 GPA or a minimum 3.0 GPA for the last 60 credits of their undergraduate coursework. The school offers scholarship opportunities for online MSN students and charges a flat tuition rate for online students regardless of residency. Located in Boston, Simmons University dates back to 1899 when a wealthy manufacturer founded the institution to offer college degrees to women. In addition to its on-campus programs, Simmons offers online programs, including an online master's in nursing designed for registered nurses without a bachelor's degree. Incoming students need an associate degree in nursing or a diploma or certificate from a hospital-based program. The RN-to-MSN program trains nurses to become family nurse practitioners. Nurses complete the 68-credit program in eight terms on a full-time schedule -- or 10 terms on a part-time schedule. Simmons blends research, theory, and practice in its training. The curriculum includes classes in advanced health assessment across the lifespan, nursing care of individuals, clinical decision-making, and primary care nursing of the childbearing family. Students also complete 836 clinical hours to gain hands-on experience. Prospective students need a current RN license in good standing. Applicants submit a current resume, official transcripts, and three letters of recommendation. The letters should come from a current clinical supervisor or nurse manager, a professor or faculty member, and an active advanced practice registered nurse. Simmons also requests a personal statement that describes career goals and prior clinical experience. Founded in 1877 as a Jesuit institution, Regis University confers degrees from its Denver campus and online. Regis offers multiple online MSN programs, including two tracks for RNs without a BSN. Incoming students with a BSN enroll in the family nurse practitioner, neonatal nurse practitioner, or leadership in healthcare systems program. The RN-to-MSN options include an MSN with a focus on education or management. Students complete 30 credits to earn the leadership in healthcare systems MSN or 47-48 credits for the nurse practitioner programs. Regis offers a customized curriculum depending on the track. Family nurse practitioners complete courses in advanced practice assessment, women's health for the family nurse practitioner, and primary healthcare of children. The leadership in healthcare systems track includes courses in ethics for nurse leaders, foundations of financial management, and healthcare organizations leadership. Nurses with an RN must complete additional bachelor's-level courses and earn a BSN during the program. Applicants need a bachelor's degree in nursing from a regionally accredited institution with a minimum 2.75 GPA; students who do not meet the minimum may apply for review on an individual basis. All applicants submit a personal statement, current resume, official transcripts, and three letters of recommendation. Regis prefers at least two years of clinical experience as an RN before enrolling. The school may conduct application interviews. Nancy Brook, RN, MSN, CNFP is a nurse practitioner at Stanford Hospital and Clinics. She has master's degrees in both nursing and counseling psychology from Vanderbilt University School of Nursing and the University of San Francisco, respectively. Nancy has more than twenty years of experience treating patients, teaching and mentoring nurses, and counseling families. She is a consultant to patients and families facing cancer and nurses facing stress and burnout, helping them cultivate meaningful careers and healthier lifestyles. She is the author of The Nurse Practitioner's Bag. Nancy lives in the Bay Area with her three children, two dogs, and a rabbit. Why did you choose to pursue a master's degree in nursing? Did this field always interest you? I chose to pursue a master's degree in nursing because my goal was to move beyond bedside nursing and become a nurse practitioner. I also dreamed of being an educator/faculty member and teaching future nurses, which required an advanced degree. While I was always interested in nursing, I learned about the role of nurse practitioner while I was an undergraduate student and became ill. My care was provided by an NP and I was so impressed with the scope of practice and the ability to be a care provider that I redirected my career in that direction. My graduate program included several components; one was research, and this allowed me to become comfortable understanding basic research as well as conducting a research study. Statistics (both qualitative and quantitative research methods) were required courses, and [they were] challenging as well. Additionally, I learned how to communicate with professors [and] professional colleagues in healthcare (physicians, pharmacists, social workers, dietitians, etc.) -- skills that have served me well throughout my career. In my current day-to-day work, these skills continue to be valuable. Nursing (and healthcare in general) is evidence-based, and understanding research is always applicable. My role has included participating in clinical trials or research studies over the years, and understanding how to interpret the research as well as how to write research papers have been valuable skills. Finally, communication is part of any career that involves working with people. While I have continued to learn more over the years, communicating with patients, families, and colleagues continues to be a basic requirement of my role. Did you complete a clinical experience as part of your master's program? If so, how did that inform your subsequent career choices? Yes, my master's program included a clinical component. I spent time in a variety of clinical settings, from ambulatory clinics to community clinics to low income clinics, as well as schools, wellness centers, and health maintenance organizations. These experiences were enlightening for me and informed the kind of work I wanted to do as a new graduate. Seeing patients in the community who had little access to healthcare was very eye opening. Overall, what are some of the greatest challenges you face in nursing? There are many challenges in nursing, as there are in any career field. The majority of our patients are sick or facing health challenges. This may sometimes lead to difficult interactions with patients or their families. Challenges in nursing include working with insurance companies to ensure patients have access to care, the ever-changing healthcare environment and regulations mandated by JCOH, sufficient staffing, and the feeling of not having a voice in the workplace environment. Additionally, dealing with life or death issues on a regular basis can lead to feelings of burnout or exhaustion. What are some changes you'd like to see in the typical curriculum for a master's program in nursing? Many nursing programs have similar curriculums with standard courses (nursing theory, research, etc.). I think the most important thing that nursing programs can do is to remain current -- to continue to update the curriculum and course syllabi to include new developments, new technology, and changes within the profession. What advice would you give to students considering earning a master's in nursing? I would suggest that you choose carefully among the many excellent programs available. Take a look at the research interests of the faculty as well as the size and cost of the program as well. Choose between an online-type program or a more traditional learning experience that involves sitting in a classroom. Ensure that the other areas of your life are such that you have the time and energy to fully engage in your graduate program. Time management is by far the biggest challenge for students, and making sure you have time for both your classwork, assignments, and clinical experiences is key. Once you have identified the program that best prepares you to meet your career goals, take that first step and don't look back. Your education is important -- an accomplishment that no one can take away and [that] will serve you well throughout your career and your life. Online master's of nursing programs are suitable for registered and licensed nurses interested in expanding their career opportunities. Students who hold an associate or bachelor's in nursing may earn their master's in nursing through a bridge program. Graduates of online master's in nursing programs can pursue managerial positions and work as advanced practice nurses. Nursing bridge programs are designed for working nurses who would like to pursue higher education. The advantage of these programs is that they allow students who have already completed some education to earn another degree quicker than usual. Some students start bridge programs as registered or licensed practical nurses (RNs or LPNs), either without an academic degree or with an associate degree in nursing (ADN). Examples of this type of bridge program would be RN to BSN, ADN to BSN, and RN to MSN online. Another common bridge program is the BSN to MSN online, in which a nurse with a bachelor's can earn a master's of science in nursing online. Courses offered in online master's in nursing programs vary depending on the school. Sample courses have been listed below. Advanced nursing: This course helps students develop advanced knowledge of their role in the field. Students learn how to become effective leaders in management positions, education, and clinical nursing environments. Topics covered include leadership, planning, and evaluation. Students also develop individual career plans and consider contemporary issues related to advanced nursing. Skills learned in this course are useful for students seeking administrative and supervisory positions. Health promotion and epidemiology: This course covers topics related to promoting evidence-based practices in health promotion and epidemiology. Students learn how to use tools needed to plan, implement, and evaluate health programs and improve patient outcomes. Cultural competence in diverse populations is an important issue covered in this course. This course is useful for students who want to become public health nurses. Health policy: This course covers a wide range of health policy issues and is suited for students interested in jobs that involve policy work. This may include administrators and other higher-level positions. Students learn to critically analyze rules and laws that impact the health care system and to advocate for changes that will improve patient care. HOW LONG DOES IT TAKE TO GET AN ONLINE MASTER'S IN NURSING? Master's degree in nursing online programs vary in length. Factors affecting program length are the number of courses available each term and whether students attends part-time or full-time. Some programs give students the choice to go at their own pace, while others adopt a cohort learning approach. In cohort programs, students progress through the program with the group they started with, taking the same courses each term. The cohort approach fosters a community of learners who support each other. Students who go at their own pace have more flexibility with how many courses they take and when. On average, it takes two to three years to graduate from an online master's in nursing program. Students who already hold an RN license or a bachelor's in nursing may be able to complete their degree faster than average. Nurse practitioner license: Nurse practitioners, also called advanced practice registered nurses (APRNs), are licensed individually by each state's board of nursing. A master's of science in nursing (MSN) is required to become one. Other requirements vary by state. Contact your state board of nursing to find out any additional steps needed to obtain a nurse practitioner license. Certified nurse midwife (CNM): This certification indicates a nurse who has graduated from a nurse-midwifery education program accredited by the Accreditation Commission for Midwifery Education. To earn the certification, the nurse must pass a national exam. Certified nurse midwives can provide a range of primary healthcare to women, including delivering babies, providing prenatal and postnatal care, and giving routine gynecological exams. When looking for online master's of nursing programs, it's important to make sure the school and program are both accredited. Accreditation is a voluntary process in which schools and their academic programs are evaluated to make sure they meet minimum educational standards. There are two types of accreditation: regional and national. Regional accreditation is more widely recognized and commonly accepts transfer credits. By choosing accredited online nursing schools, students can be assured they will get a quality education. It's also important for nursing students to make sure the online program they choose has an industry-specific accreditation. Nursing programs in the United States are accredited by the Commission on Collegiate Nursing Education and the Accreditation Commission for Education in Nursing. Two organizations play important roles in accreditation: the Department of Education and the Council for Higher Education Accreditation. The Department of Education (DOE) is a U.S. government agency that establishes policy and coordinates federal assistance, including student loans and grants. The DOE publishes a list of nationally recognized accreditors that students can trust. The Council for Higher Education Accreditation is an organization of degree-granting American colleges and universities. Its purpose is to coordinate the accreditation process for higher education in the United States by ensuring the quality of accrediting agencies. For a list of all accredited schools, visit the Department of Education or the Council for Higher Education Accreditation. Qualified nurses are in high demand across the country. President Obama's Affordable Care Act has expanded health insurance coverage to millions of previously uninsured American citizens, and an aging baby boomer population has also increased the need for trained nursing personnel. According to U.S. News & World Report, registered nurses with a bachelor's or higher enjoy a low unemployment rate at only 2.1%. Furthermore, the field is projected to increase by 15% -- roughly 438,100 jobs -- between 2016 and 2026. These figures are even more favorable for other nursing professions; for example, jobs for nurse anesthetists, nurse midwives, and nurse practitioners are expected to grow 31% during the same period. According to a recent survey by Georgetown University's Center on Education and the Workforce (CEW), the job outlook is especially good for nurses with a graduate degree. While experienced nurses with a bachelor's enjoyed a low unemployment rate of 1.9%, those with a graduate degree were even better off at 1.6%. The relatively low number of nurses who earn a master's is likely one of the main reasons for this disparity. BLS notes that only 9% of registered nurses -- fewer than 200,000 -- hold a master's degree; bachelor's-holding registered nurses, by comparison, represent 46% of the profession. In addition to better job placement rates, nurses with a master's also stand to outearn their bachelor's-holding counterparts by a considerable margin. The CEW survey found the average nurse with a graduate degree earns roughly $81,000 per year, compared to recent bachelor's graduates who pull in less than $50,000 on an annual basis. BLS also found that the median salary for a nurse with a master's was $12,000 higher than that of a bachelor's-holding nurse, representing a wage premium of 19%. MSN graduates also stand to make more over the course of their careers. Using data from the 2015-16 PayScale College Salary Report, the table below features expected earnings for nurses with an associate, bachelor's, and master's degree at two different career stages. As indicated in the table above, the average MSN salary at the mid-career mark is roughly 38% more than the salary for nurses with an associate degree and 21% more than the salary for nurses with a bachelor's. Another key observation: only $4,400 separates the entry-level salaries of associate- and bachelor's-holding nurses, while more than $25,000 separated the starting salaries for nurses with a bachelor's and those with a master's. Although a master's degree will boost a nurse's earning potential, salaries will vary by nursing profession. The rate at which these salaries grow over time will also depend on the specific job. The following table uses PayScale data to break down some of the most common career pathways for MSN-holding nurses. MSN students will be qualified for hundreds of nursing jobs once they graduate, although opportunities will vary by the candidate's degree specialization. Some pursue niche patient care roles in fields like midwifery and anesthesia, while others assume managerial and/or administrative responsibilities at medical facilities. Some of the most common career pathways for MSN graduates are listed below. Registered Nurses: According to BLS, more than 2.75 million registered nurses (or RNs) are currently employed in the United States. RNs are responsible for delivering patient care, coordinating treatment plans, and maintaining up-to-date records. They typically work alongside physicians, and may manage teams of nursing assistants and orderlies. Nurse Anesthetists, Nurse Midwives, and Nurse Practitioners: Nurse anesthetists, nurse midwives, and nurse practitioners are collectively known as advanced practice registered nurses (APRNs). They handle niche areas of patient care. Anesthetists specialize in providing anesthesia for patients before surgeries and other procedures. Midwives assist pregnant women during the childbirth process. Nurse practitioners often take on the role of primary care provider, working directly with patients and overseeing the other nursing personnel that care for them. Licensed Practical and Licensed Vocational Nurses: Licensed practical nurses (LPNs) and licensed vocational nurses (LVNs) provide basic medical care to patients under the guidance of nurse practitioners, physicians, and other onsite managers. Day-to-day duties include changing bandages, checking vital signs (such as blood pressure), and assisting patients with basic tasks like eating and bathing. Medical and Health Services Managers: Medical and health services managers work behind the scenes to oversee the way patient care is coordinated, delivered, and evaluated at different healthcare facilities. They work closely with physicians, nurses, and other personnel to ensure their worksite is sanitary, outfitted with up-to-date equipment and compliant with medical laws and regulations. Nurse Anesthetists, Nurse Midwives and Nurse Practitioners $110,930 31% Master's degree with a specialization Varies by state; certification is required in states that recognize APRN roles. Making professional connections and learning about different approaches to nursing is crucial to your success. Professional organizations offer a great entry point for students who want to learn more about their chosen career path. Below you'll find three of the country's most prominent organizations established for professional nurses. These organizations host networking events, provide online trainings, maintain active job boards, and offer other services for career-ready college graduates. Resources like these often prove invaluable as you complete your degree requirements and prepare to enter the job market. American Nurses Association: The ANA was founded in 1896 to improve the working standards and conditions for professional nurses, and the organization has continued this work to the present day. Members receive access to a vast online resource library, discounted certification and recertification rates, access to five ANA publications and an invitation to the organization's annual conference. American Academy of Nursing: The AAN follows a mission of "advancing health policy and practice through the generation, synthesis, and dissemination of nursing knowledge." The organization today represents more than 2,400 members. Emergency Nurses Association: Established in 1968, the ENA was created to represent nurses who serve patients in emergency rooms, critical care units, and other highly demanding settings. The organization today advocates for patient safety, as well as optimal emergency nursing practices. Despite the relative affordability of online MSN programs, most students still need financial assistance. Students should complete a Free Application for Federal Student Aid (FAFSA) form to learn more about loans, grants, and other opportunities offered through the U.S. government. Additionally, private grants and scholarships are widely available through nonprofit organizations, companies, and other sources. Check out our collection of resources below to learn more about financial aid options. Many of today's college students are unable to afford an advanced degree, and those who pursue an MSN are no exception. Our list of the cheapest online MSN programs is geared toward nursing students on a tight budget. Similar to an MSN, a master's in healthcare administration is designed for students who are interested in pursuing managerial roles in hospitals, clinics, and other medical facilities. Check out our list of the country's best graduate-level programs for aspiring healthcare administrators. Physician's assistants -- like many nurses -- provide critical backup for doctors, surgeons, and other high-level medical personnel. We've created a list of the country's top five online master's degree programs for aspiring physician's assistants.